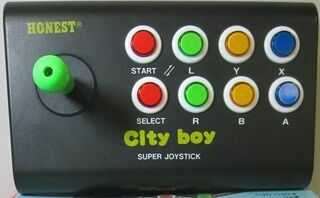 The City Boy is an arcade stick created by Honest in the early 1990s. It is primilary seen in Asian countries such as Taiwan. The City Boy is a multi-platform controller compatible with the Sega Mega Drive, Famicom, Super Famicom/Super Nintendo Entertainment System and PC Engine/TurboGrafx-16 (a separate stick is thought to have been released for the Neo Geo under the same name). It is built with similar parts seen in real arcades, with microswitched joysticks and buttons housed in a solid shell. There are also turbo features and changable joystick heads. It is thought to be compatible with six button Mega Drive games also. The history of the City Boy is not yet fully understood - it is thought other companies distributed the stick in other regions of the world in small numbers. Successors exist as the City Boy 2 and City Boy III.